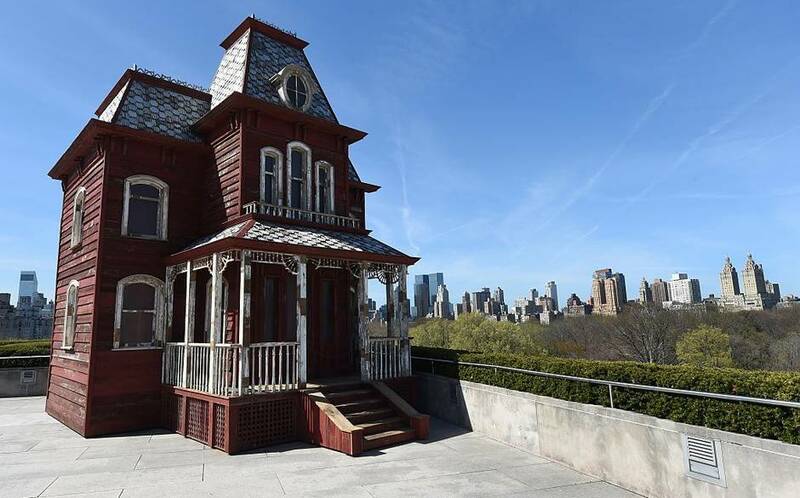 Every year around this time, the Metropolitan Museum of Art trots out its conception of “contemporary art,” in a specially commissioned work for its rooftop terrace. Cornelia Parker, PsychoBarn (2016), Metropolitan Museum of Art. This year’s example is an architectural installation entitled PsychoBarn, by the British artworld star Cornelia Parker—“whose work is in museums around the world,” notes the New York Times. In remarks to the press ahead of the piece’s opening to the public, Parker lauded the commission as “such a gift to an artist!” Quite so. Why was she chosen? According to the Met’s director, Thomas P. Campbell, her work “is remarkable for the ways in which she looks at things we think of as familiar, and up-ends our perception of them in the process.” As for why we should welcome having our perception of familiar things up-ended, he didn’t venture to explain. One of the things Parker up-ends is familiar notions of the art of sculpture. Referred to by herself and others as a “sculptor and installation artist,” she first gained artworld notice with a 1991 piece entitled Cold Dark Matter: An Exploded View. She created it by having the contents of a garden shed exploded by the British Army and then suspending the resulting fragments from a gallery ceiling in an installation lit from within by a bare light bulb. According to Britain’s Tate museum, which now owns the piece: “The way the sculpture was made is a significant part of its meaning as an artwork.” Perhaps. But it is not the way a work of sculpture, properly speaking, is made. Nor can one guess the piece’s intended meaning without an accompanying curatorial gloss or artist’s statement. Without such verbal texts, what one perceives is simply a rather attractive pattern of mostly abstract forms and cast shadows. By familiar standards, Parker’s PsychoBarn is a derivative bit of quasi architecture, not sculpture. In a fast-talking account of the piece’s genesis and intent, she explains that it was modeled on the notorious Bates house in the Alfred Hitchcock thriller Psycho—which had been inspired in turn by Edward Hopper’s painting House by the Railroad. The “barn” in Parker’s title refers to the other element involved in its creation—the homely red barns dotting America’s rural landscape, one of which (slated for demolition in upstate New York) had supplied the materials used by skilled workmen to construct PsychoBarn according to Parker’s directions. In her account, Parker comments glibly on multiple layers of meaning in the piece. For visitors who don’t bother to read its wall text, however, I doubt that such meanings would occur to them. More likely, they will view the piece as I did—as an amusing folly, sitting atop the Met like a stage set without a play. As I was leaving the Met, I happened to pass through its Medieval Sculpture Hall, where my eye was caught by a work I had never noticed before—a barely yard-high early-15th-century Burgundian Virgin and Child set against one of the hall’s lateral pillars. Virgin and Child, Burgundy, ca. 1400–1425, Metropolitan Museum of Art. What struck me was the Child’s playfully animated engagement with his wide-eyed mother, whose sweetness of face was evident in spite of unfortunate damage to her nose. This captivating work (the gift of a discerning collector, J. P. Morgan) was a vivid reminder of what sculpture really is. Another was the medieval hall’s centerpiece, Claus de Werve’s superb Virgin and Child, a work I’ve written (and spoken) about before. As I passed it, I noticed a woman pausing to admire it and take a photo. On inquiring, I learned that she was a visitor from Australia who had happened upon that work quite by chance, drawn to it by its gentle power and beauty, not because she had known anything about it beforehand or knew anything about the artist. Unlike Parker’s PsychoBarn, these two splendid works of genuine sculpture contain their own drama and speak for themselves. I wonder what the craftsmen earned for building the house in PsychoBarn? Good question, Roy. Not nearly as much as the far less skilled “artist” involved, I’d guess. 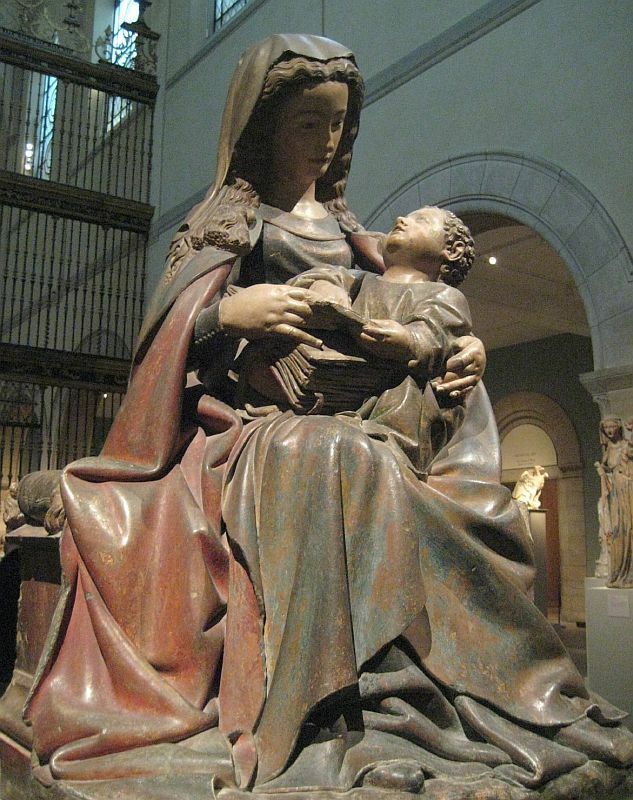 The Burgundian Virgin and Child nearly brought me to tears. Its simple beauty represents the essence of incredible sculpture and art. “PsychoBarn” also nearly brought me to tears. It is neither sculpture nor art but a mock up of an old movie set.